For those of us in the Northern Hemisphere, summer is over. In the U.S., Labor Day has passed, school has started, the sun is setting sooner and we're getting ready to tuck away our white clothes and shoes until spring--well, at least that's what we've been told to do. A suggested ban on white clothing and shoes after Labor Day, the first Monday of September, has been a rule of etiquette since the early 20th century. But is it really all that important by today's standards? Fashion--and even an etiquette expert or two--doesn't think so. 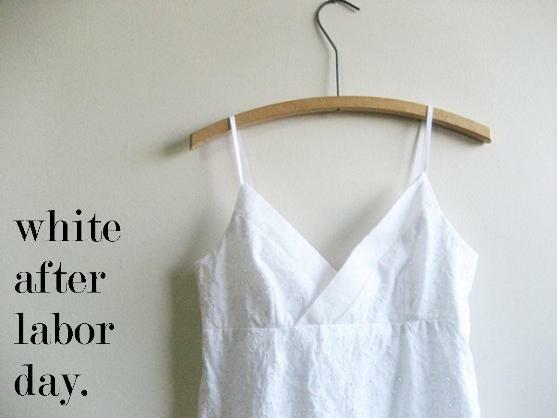 In recent seasons, white has become an all-year hue. And a few other formerly fatal color combinations--brown and black, black and navy--have moved from fashion don't to fashion can-do territory, too. "For centuries, wearing white in the summer was simply a way to stay cool--like changing your dinner menu or putting slipcovers on the furniture," wrote TIME's Laura Fitzpatrick. In the early 1900s, clothing covered a lot more of the body than it does now, so summer whites, with their reflective qualities, made sense. But beyond practicality, white had a following in high society that may have led to the no-white rule. "In the early 20th century, white was the uniform of choice for Americans well-to-do enough to decamp from their city digs to warmer climes for months at a time: light summer clothing provided a pleasing contrast to drabber urban life," Fitzpatrick wrote." Labor Day, celebrated in the U.S. on the first Monday of September, marked the traditional end of summer; the well-heeled vacationers would stow their summer duds and dust off their heavier, darker-colored fall clothing." Of course, this theory is hotly contested by some--Judith Martin, aka Miss Manners, told Fitzpatrick not every rule of etiquette has to be attributed to "snobbery." But whether the rule was meant to be snobby or not, the fashion world hasn't been ruled by it. And perhaps that's why etiquette queen Emily Post says it's OK to throw this rule out with the last of the summer barbecue leftovers. After being considered a faux pas for so long, the black-and-brown combination--which has been given the go-ahead--is actually a fresh one. According to the Ralph Lauren Style Guide: "When properly executed, the combination of black and brown is a very modern and sophisticated look that’s instantly elegant. Start by adding touches of brown via accessories: the hint of a leather belt beneath a black cardigan or suede boots under slim-fitting pants." For women, Ladies' Home Journal says, "Pair rich brown wool trousers with a black turtleneck, or wear black shoes and hose with your brown skirt. For evening, try a brown cocktail dress instead of a black one." 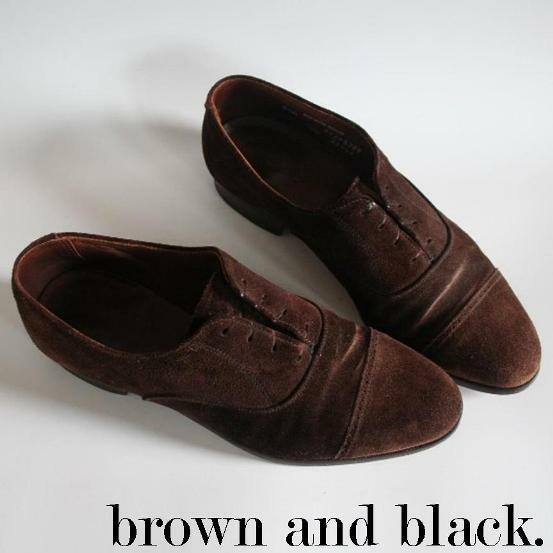 And a great tip for mixing-and-matching your shoes and handbags?" Try a deep red, hunter green or soft tan bag, or go for shoes in similar shades, all of which will work with your brown and black staples." 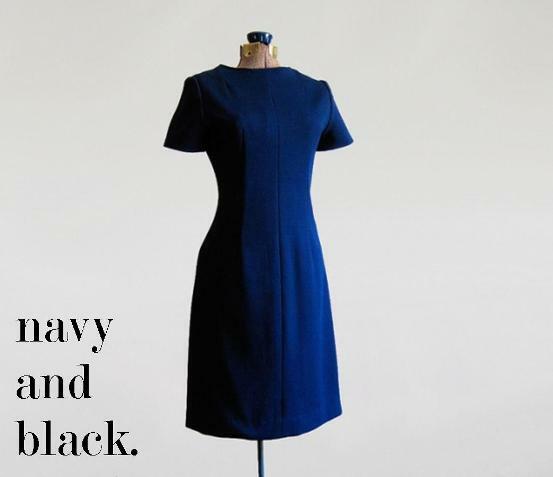 Navy and black make for another recently edgy combination--good news for navy lovers who may have had trouble matching shades of blue, or black lovers who have the same trouble matching blacks. This combination works a lot like black and brown in execution--try pairing a navy dress with black tights and shoes or skinny black pants with a navy blazer for a runway-worthy look. Black shoes are also a good choice with a navy suit, though some advise a deep brown pair--GQ Style Guy Glenn O'Brien says to pick a pair at least as dark as your suit. But he also said, "Not long ago, I read a little manifesto in the catalog of the talented potter Jonathan Adler that stated, among other things: 'We believe colors can't clash.' I am coming to this view more and more." Looks like others are, too. Header photo by timelessvintageshoes via Etsy. Love the Sweater Rebel colors. Gets us ready for the fall. Hmm. I had heard of the "no white after labor day", but I have also seen that "official" fashion rarely affects what people wear on a daily basis--most people put wearing clothes they like before wearing clothes that are fashionable. I've seen plenty of white after labor day on people who like white. I feel like fashion is becoming less strict and more of a way of expressing yourself, although that may be just my wishful thinking. I really like black-blue combo for woman. But for a guy, like my dad, to ware a blue suit with black shoes... That's something to get use to. Suede shoes would do I guess... yeah, that would do fine.